Tennis requires speed, strength and agility. Tennis can be a thrilling sport, but unless you are in shape, you could be caught watching the ball whiz past you. 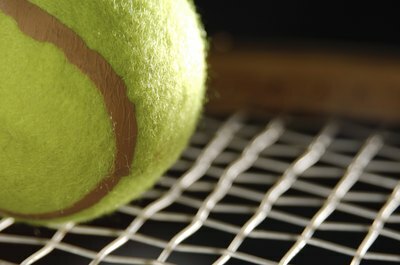 Tennis requires strength, endurance, speed and technique, all of which require a fit body. A great physique also helps to reduce injury and may help to correct muscle imbalances. 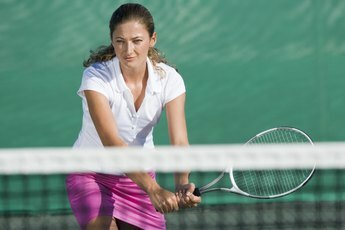 Tennis works primarily the legs, arms and core, so to strengthen your body for tennis, focus on working these key areas. Include a warm-up, cool down and stretching after exercising or playing tennis to avoid injury. If you strengthen your body for tennis, not only will you look and feel great, you will greatly improve your tennis game. Perform the barbell side split squat. Stand up with your feet wide apart, forming a V shape with your legs. Hold a barbell along the top of your shoulders, behind your neck. Bend your right knee as you lean to your right side and bring your chest forward. Keep your back flat. Return to the starting position. Bend your left knee as you lean to your left side and bring your chest forward, maintaining a flat back. Repeat 15 times on each side. This exercise strengthens and stretches your quads, which is important when you shift sideways on the tennis court to reach the ball. Get into a pushup position, and lower your body down for a pushup with leg lift exercise. When you are almost touching the ground, lift your right leg into the air. Hold it there for 10 seconds. Lower your leg and come back to the starting position. Lower your body down again close to the floor. Lift your left leg and hold it there for 10 seconds. Lower your leg to the ground and return to the starting position. Repeat 10 times to work your arms. Incorporate dumbbell lying pronations to strengthen your forearms. Lie on your right side on a bench with your knees bent and a dumbbell in your right hand. Place your left hand on your hip. The palm of your right hand should be facing you with the dumbbell perpendicular to the ground. Twist your arm so that the dumbbell is parallel with the ground, and then twist it back to perpendicular to the ground. Repeat this 10 times. Do it again with your left arm. Do the crossover crunch. Lie on the floor on top of a mat or towel. Place your feet flat on the floor with your knees bent. Put your hands on the back of your head. Contract your abdominals as you bring your left elbow toward your right knee. At the same time, lift your right knee off of the ground toward your left elbow. Return to the starting position. Repeat on the other side to get your core into shape. 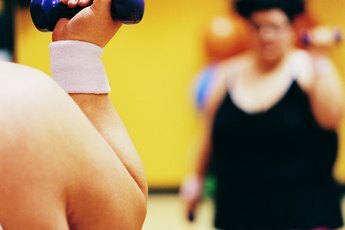 Add cardio to your exercise routine. Run sprints uphill, do shuffle steps and interval running to increase your speed on the court. Bike and swim to increase your endurance. You should include at least 150 minutes of moderate cardio each week into your schedule.